Offering quality grip in wet and oily food processing conditions, the Ansell VersaTouch 37-200 Green Nitrile Gauntlet Gloves are ideal for providing hand protection in a wide range of food industries. They are also latex free to present no risk of Type 1 allergies. The product code for the gauntlet gloves is: 37-200. If you desire additional hand protection, then the VersaTouch 37-200 Gauntlet Gloves can be worn over thermal liners or cut-resistant gloves. This way, you can enjoy all the benefits of the VersaTouch while also receiving warmth or cut protection as required. For more information about the food compliance of the 37-200 gauntlet gloves, please consult the Food Declaration of Product Compliance in the PDF below. 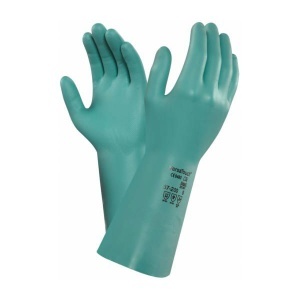 The Ansell VersaTouch 37-200 Gauntlet Gloves are available in a choice of sizes, making them suitable for most users. Please consult the table below for details, then select the required size from the drop-down menu at the top of the page. The gauntlet gloves have a thickness of 0.2mm and a length of 320mm.